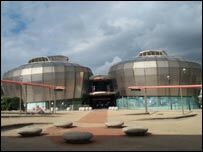 The former National Centre for Popular Music is to be bought by Sheffield Hallam University, it has been confirmed. The university will buy the building from current owners, Yorkshire Forward, for £1.85m and use it as a new Students Union. They will also re-locate their School of Cultural Studies, currently based at Psalter Lane, into a brand new building on the site of the current Students Union. The university says this will act as a catalyst for a £17m investment to develop part of the city centre. The lotttery-funded National Centre for Popular Music closed as an attraction in 1999 due to low visitor numbers. Critics of the university takeover had claimed the deal would mean the building would no longer be open to the public. But the Students Union say they plan to run a full programme of events which will be open for anyone to attend. They also plan to develop the building into a small and medium-sized venue which could be hired by groups in Sheffield to stage their own shows. Yorkshire Forward chief exceutive Martin Havenhand said: "We are delighted to have concluded a deal with Sheffield Hallam University to secure the future of the iconic building which will allow people from the city of Sheffield access to cultural events."